The Interdisciplinary Major advanced studies track will offer students with superior ability, exceptional self-discipline, and unconventional academic interests the opportunity to design their own program of study. Students will complete application for admission into the Advanced Studies track and assemble a Faculty Advisory Board made up of one faculty member from each department included in the proposed interdisciplinary major. Students and their faculty advisors will devise a program of study and mutually agree upon a faculty advisor to serve as the chairperson of the Faculty Advisory Board. This board will review the proposed program of study and ensure that it does not duplicate an existing traditional program offering. Students will be required to meet with the chair of their Faculty Advisory Board prior to registering for courses during each semester of their enrollment in this program. The board chair, in consultation with the Faculty Advisory Board, will supervise the development of the student’s portfolio throughout the student’s enrollment in the program. Applications will be submitted to the Director of the Interdisciplinary Major. Students will be responsible for identifying one faculty member from each department represented in their proposed Interdisciplinary Major. Students and their faculty advisors will devise a program of study and mutually agree upon one faculty person to serve as the chairperson of the Faculty Advisory Board and submit an application outlining this plan to the Director of the Interdisciplinary Major. 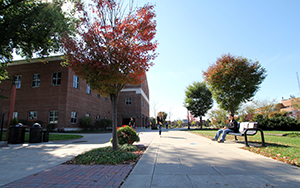 There will be Fall and Spring deadlines approximately halfway through each semester. These deadlines will allow the Director of the Interdisciplinary Major to review applications before students begin scheduling for the next semester. What happens if an Advanced Studies application is denied? An Advanced Studies application may be denied if a student’s academic interests can be addressed through an existing major, the University lacks the resources to adequately support students’ unique academic interests, or the application lacks sufficient detail. In the event that a student’s application is denied, that student will receive feedback and redirection from the Director of the Interdisciplinary Major. When may students apply for the Advanced Studies track? Students typically will apply for the Advanced Studies track after completing a minimum of 30 credits but fewer than 60 credits. May Advanced Studies students pursue a double major? Yes. Advanced Studies students may pursue a double major; however, they may not count the same course for both majors. Who will supervise the senior integrative capstone experience for the Advanced Studies track? An Advanced Studies student, in consultation with his or her Faculty Advisory Board, chooses a faculty member to serve as the student’s mentor. The student will submit an Independent Study proposal to the Office of the Dean in the College of his or her thesis mentor. With respect to student learning outcomes, the Faculty Advisory Board will use extant value rubrics to select several relevant criteria upon which the student's performance will be evaluated.